A big thank you to everyone who climbed with me in 2003! Ouray CO Ice Climbing - Ice climbing in Ouray is hard to beat. It is a great way to gain some skills on ice and confidence on steeper terrain, and the most fun you can possible imagine in the middle of winter. Combining the trip with a bit of downhill skiing in Telluride makes this the perfect winter getaway. I always go to Ouray every year. It is a terrific experience. Trust me. We have regularly scheduled 3 and 5-day programs. The 5-day programs are the best, they allow time to develop your skills, then put them to use on fun climbs. If our schedule doesn't work for you, then make up your own. The cost is the same for a private trip if you have 2 or more climbers. Choose the dates you want to come, and we will set up a program that suits you! Any time from January through February is the best. Valdez, AK Veteran's Ice Climbing - Last year's trip was a great success, and leaders Jeff Ward and Chris Booher will be returning in 2004. I hope to go along with them this year to see this unique area and do some fun multi pitch ice climbs in Keystone Canyon. This is for past ice climbing participants only. You need to be comfortable following Grade III and IV climbs. March 1-5, 2004. Mt. Hayes, AK - I have had my eye on Mt. Hayes for a couple of years now. You can see it on the eastern edge of the Alaska Range from Mt. Sanford and Blackburn. I haven't heard of anyone guiding this before, and it sounds like a climb right up my alley - a bit more challenging, moderately steep slopes and the total Alaskan experience! We'll be heading to Mt. Hayes the last two weeks of April. You need to have been on a past expedition and have some steeper climbing under your belt to participate in this one. Mt. Whitney, CA, winter snow climb via the Mountaineer's Route - I go on two of the Whitney climbs every year. It is a great escape to a sunnier, more scenic climate, and the climb of Whitney is a wonderful experience. It has all the ingredients of a classic snow climb - a great next step for those who want to get some more climbing under their belts. 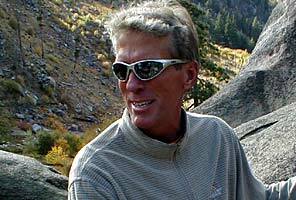 I like to do a Whitney climb then spend a couple of days skiing at Mammoth Ski Area. I contract the Whitney climbs with friend and fellow Rainier guide, Kurt Wedberg of Sierra Mountaineering. Kurt operates under permit in Inyo National Forest. Mt. Bona, AK - We had an excellent trip to the seldom visited Russell Glacier on Bona two years ago, but missed the summit on our last day. I feel like this is unfinished business and I am going back one last time to this remote side of the mountain to top it off. The Bona trip is the last two weeks of May. This is a great first time to Alaska expedition, with good exposure to glacier travel and expedition life. Mt. Logan - Mt. Logan is back on the roster for 2004 in mid-May. I'd be leading the trip except for my Hayes and Bona trips. The expedition will be led once more by the very competent Vince Anderson. This three-week expedition requires strong backcountry skiing skills. Mt. Adams Seminars - I have taken over leadership of IMG's Adams Glacier Seminars on Mt. Adams in Washington State. I wanted to create the perfect 5-day glacier training seminar to use as a basis for training future climbers in the fundamentals of glacier travel. Another plus is we get to climb the more remote side of Mt. Adams via the North Ridge or the Adams Glacier. The plan to use this program to school climbers prior to expeditions to Alaska, South America and the Himalayas. June 14-18 and June 28-July 2, 2004. The Alps - We have some big changes in store for the Alps programs in 2004. I decided to break my normal routine of visiting every other year and go back in 2004 to see these take shape. We'll be offering a new "standard" program - a Mont Blanc and Monte Rosa Alpine Tour - visiting the two most famous massifs in the Alps. We'll spend 10 days in July traversing glaciers out of Chamonix and Zermatt, moving from hut to hut training in rock climbing and glacier climbing skills as we climb peaks along the way. The ever popular, Classic Climbs in the Alps, starting the last week of July, will take on a slightly more advanced nature as it tackles the classic climbs: the Jungfrau; a traverse of the Mont Blanc Massif via the Cosmiques Hut; and Monte Rosa's highest summit, the Dufourspitz. These climbs require 2:1 guiding. Finally, the season will end with the classic Matterhorn program in August. It alone remains essentially unchanged. If you haven't visited Italy and the Dolomites yet, then this is the time to do so. The area is beautiful and the rock climbs are fun, athletic adventures with no previous rock experience necessary. This program runs in mid-July. Alpamayo - This is one of the classically beautiful alpine faces in the world. You'll need the whole arsenal of climbing skills to attempt this one, excellent fitness, previous experience at high altitude, and the ability to follow ice of Grade III to IV for multiple pitches. Set for August 14-29, 2004 and led by the ever popular Jeff Ward. As always, I will be spending a part of the summer guiding on Mt. Rainier for Rainier Mountaineering, Inc. I'll start the season in early June with a climb of Liberty Ridge (May 30-June 2), followed by a first-ever guided climb of the Ptarmigan Ridge (June 6-9). I'll be leading a Camp Muir Seminar later in the summer, (September 27 to October 1) which I feel is the best place and time to really learn glacier travel skills, crevasse rescue and good cramponing practice. Come visit me on Rainier on one of these programs, or better yet, set up a private climb of Rainier with me. Joshua Tree Rock Climbing in October is a new MUST for me. In 2003 I attended the program for the first time, and got hooked. The area is one of the best rock climbing centers of the world, the Park is high desert, warm, sunny and picturesque. The easy, relaxed camping is a pleasant way to wind up the summer. Joshua Tree gets my nod for Best Unsung Trip of 2003. I'll definitely be returning next year! Come climb with me in 2004. If you have a unique group, or an interesting climb in mind, drop me a note. Let's put something interesting together. I already have some great programs in mind for 2005: Ice climbing in the Banff, Lake Louse area of Canada in February; a trip to the North Ridge of Universty Peak in Alaska, and a return to the Himalayas to lead a trek into Everest Base Camp and climb Island Peak in the spring. Plus, as always, I have a couple of secret projects in mind I can't reveal at this time. Drop me a note if you want to find out more! This program just keeps building in interest. About half of our participants are now repeats from previous years, so it must be a good thing! Thanks to everyone who participated. There are so many, I'll just list you all in one group, but all of our programs consist of small groups of individuals, 2 to 6 in total. Congratulations to Charles Allen, David Andrews, Donald Atkinson, Gail Bredis, Clif Cassidy, John Clark, Diana Connors, David Cullen, Dan Cummiskey, Cole Hanley, Charles Hill, Michael Hueser, Sam Insalaco, Joshua Knox, Ray Kopcinski Sr., Ray Kopcinski II, Elizabeth Krebs, Joe Ladowski, Paul Later, Greg Meyering, Dan Nemoto, Matthew Nofziger, Karen Northcutt, Jackie Paulson, Mark Reitman, Julie Rogers, Robert Roos, Marc Sargis, Dale Schmidt, Dori Schmidt, Doug Steakley, Sherry Steel, Nicholas Subashi, Xander Subashi, Catherine Thach, David Thompson, Steven Tooley, Ronald Verde Rose, Richard Villalobos, Carl Werts, Jimmie Worrell and Gregory Wuller. Thanks to my crack team of guides as well, Jeff Ward, Chris Booher, Ben Marshall, Jake Norton and Mark Cionek. Congratulations to the first participants of this new program. A good time was had by all and some hard climbs were done including Keystone Greensteps, a substantial Grade V climb. Nola Royce, Greg Fowler, Jeff Johnson, Steve Bomar and guides Jeff Ward and Chris Booher. This turned out to be my most enjoyable climb in Alaska this year. We had a fun group, and held out during some windy conditions. The weather abated, and we went for the summit! The climbing afterwards was almost more fun than the summit. Thanks to Charlie Larnard, Tim Burch, Bob Austin, Fred Mauren, Catherine Jablonsky, Bill Gibson and Mark O'Day. I was ably assisted by John Race and Olivia Cussen. Thank you, Olivia, for keeping John on his medication. A great year with a series of successful climbs. This program is contracted with Sierra Mountaineering International, who operates under permit in Inyo National Forest. Thanks to all the participants. Dennis Tweedy, Dale Gentle, Thomas Edelmann, Steven Pernerewski, Allen Sansano, Rita Simonitch, Thomas Odell, Sheldon Gilchrist, Josiah Garrison, Ken Klug, Gail Bredis, Paul Torrence, Michael Buerk, James Parell, Todd Cornelius, Peter Carney, Dale Carley, Jackie Paulson, Bob Larock. And hats off to the SMI guides, Neil Satterfield, Chris Ecklund and Kurt Wedberg. Well, you can't win them all. A major storm dumped huge snow on the route just prior to our arrival. After three attempts shoveling our way up through head height snow, we called it quits and did some fun climbing on surrounding points. After 4 unsuccessful attempts, I'll never go back to Mt. Blackburn. I mean it! Don't try to talk me into it! Thanks, however, to a great group who never gave up, never got mentally down and who built the best snowcave/entertainment complex I have ever seen (well, ok, the guides did most of it). Roger Pedigo, Gary Gurizzian, Kevin Vinnes, Timothy Jung, Perry "metalneck" Julien, and Pat Luke. Thanks to the great guides who helped lead the way, Jeff Ward and Casey Grom. Oh, and thanks for the pecans, Pat. I am still enjoying them. Gary, I still have your ski pole part. I'll send it soon, I promise! This is the unsung gem of the European Programs. Brent Okita, who has done them all, says this is the best program he has ever done in Europe. 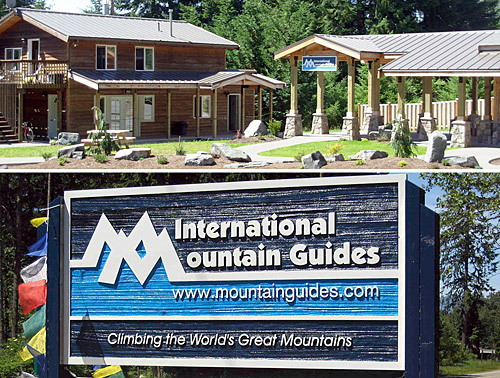 Spectacular scenery, fun and enjoyable climbing, and great hospitality and cuisine. The Dolomites have it all. Thanks to Jim and Katy Swetnam who joined Brent and Julie Okita in Italy last year. I added an extra Classics trip last year to meet demand. This first program was for some past participants and friends. Thanks to Bill Snyder, Steve Townsend, Jeff and Shari Roberts, Dennis and Kathleen Tyree, James Gardner and Rachel Baskette. Special thanks to Howie Schwartz, AMGA certified guide for leading the way for us. Despite a record dry summer and heat wave in the Alps, I feel we accomplished quite a bit and had a super time doing it. Congratulations to Steve Townsend who hung around after the trip and summited the Matterhorn with Howie. We made some changes for this program based on our experiences on the previous trip. This formed the idea for my new program changes for 2004. Congratulations to Gail Bredis, Monica Rimai, Stacey Ries, Cynthia Williams, DeLane Frutiger and Walter Clark for being the experiment. Thanks to Vince Anderson, AMGA certified guide for coming up with all the good solutions. Thanks also to all of you for helping me to celebrate my 50th birthday in Europe! It was one of the best I can ever remember. Special congratulations go to Cindy Williams for staying on and summiting the Matterhorn with Vince. This program is always a tough one, but this year's team climbed and trained hard in anticipation of a long, fast, crowded rock climb up the Matterhorn. Everyone made it most of the way up, and half of the group summitted the Matterhorn. I salute Jill Jones, Deborah Maddox, Glenn Beaton and Allison Clark. Thanks to guides Vince Anderson and Howie Schwartz for leading the way. I envisioned the Alpamayo climb to be a final challenge for past participants of IMG programs who have mastered ice climbing and completed some serious alpine routes. It is not an easy climb. This year proved to be no exception, as the mountain was not in good shape and no attempts were being made on it when the group arrived. The team focused on the neighboring Quitarahu, and succeeded in climbing a 15 pitch ice route up its face in a marathon summit day. Congratulations are indeed in order for Chris Nichols, Tad Linn and ace ice guide Jeff Ward. After a busy summer guiding in Europe and then finishing up on Rainier, it was a true joy to head down to the Joshua Tree rock climbing seminar in October. I really enjoyed myself and the group I shared the trip with. Thanks everyone for a great experience. Michael Claes, Dwight Oneil, Johnathan Felten, Matt Lancto, Cindy Williams and Bob LaRock. A hearty round a thanks too, for guide Jeff Ward. Thanks for having me along! OK, all you veterans. I am rested up from last year, spent all of November in the office, and now I want to get out and CLIMB! Let's make 2004 a memorable year. I'll bet we can do it. I thought 2002 was a busy year, that is until 2003 came around. I had the opportunity to revisit most of the Seven Summits this year. The Seven have always been fun climbs but they are also a great excuse to go see the world. I plan on being on most of them again in 2004. 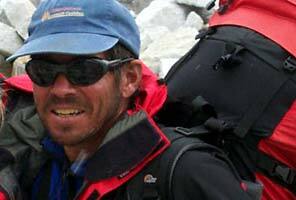 I led many expeditions in 2003 and had the opportunity to climb with several great guides. Kent Wagner worked with me on Aconcagua in February and climbed with our team in August. He'll be heading down to Aconcagua again in January 2004. Adam Clark and I teamed up on Aconcagua and also on McKinley. Dave Hahn headed up our January 2003 Vinson Expedition. Dave knows Vinson as well as any guide around. Chris Booher climbed Kilimanjaro in August and worked on numerous additional climbs for us in 2003. We may have to try to keep him in the States more in 2004. Lindsay Reither joined me in Ecuador and stayed after the trip to do even more climbs. Kevin Slotterbeck climbed with me in Mexico last month and Jeff Ward led a trip to Mexico for us in February. Additionally, we climb with some great foreign guides. My dear friend, Romulo Cardenas, always works with me in Ecuador and will be joining me in Antarctica this month. We are joined by Igor Tsarouk on all our Elbrus trips. What a great addition to our programs. And, 'Oso, the Bear' joined us in Mexico this year and will do the same in 2004. Who is doing the actual guiding is what really separates one guide service from another. Pick a new country and a new mountain and join us in 2004. My wife, Susan, and I will be leading a trek to Everest base camp and climb of Island Peak in March 2004. Isn't it about time you saw the Himalayas? I hadn't been down to Aconcagua personally for a few years so it was truly enjoyable to get back in February 2003. Getting to the summit required patience and stamina but the team did just that. We waited for weather to clear until our last possible summit day and it was worth the wait. Cold but clear and very little wind. (Thank God) The summit day on Aconcagua is more demanding physically than the summit day on McKinley. But, nothing worthwhile is easy. Congratulations to Dave Pederson, Laurie Pearce, Mark Ursino, Peter Hendrycks, Sidney Teague, Steve Wilson, Tracy Purcell and guides Kent Wagner and Adam Clark. We saw the summit of Cayambe and Cotopaxi on our January 2003 trip. I'm heading down again in January 2004 and am always anxious to get back to Ecuador. This is a country not to be missed. The people are great, the scenery is extraordinary and the climbs will push you. You'll get a good return for the 13 days you invest going to Ecuador. Congratulations to Barry Hofner, Geoffrey Gephart, Lee McClenaghan, Lew Miller, Mark Rietman and guides Romulo Cardenas and Linsay Reither. It's hard to not enjoy a couple of big mountains and great weather during the week we're in Mexico. The Ayoloco Glacier is a great route on Ixta and Orizaba is always a good work out. We work closely with the Reyes family in Mexico and have done so since 1976. To say they take good care of us is an understatement. John Race will head up our February 2004 trip and I'll go back down with the November 2004 team. I'm always ready for a week of sun come November. This November, the weather was great and up we went. Congratulations to Bob Breunig, Bob Zimmerman, Chip Merriam, Don Dahlk, Guy Orangio, Harry Ellison, Juerg Brandle, Michael Bouro, Paul Torrence, Scott Remphrey and guides Kevin Slotterbeck and Oso. Jeff Ward led a successful private team to Mexico in February 2004. Five friends got together and put their own team together. What a sweet way to climb. Congratulations to Devin Eckhoff, John Lang, John Levoy, Nathan Pailes and Wayne Gariel. I led a small group for Rainier Mountaineering to McKinley in late June. It wasn't an easy summit day but it was a summit day. We came away with an added respect for wands, compass, altimeter and GPS. Navigation skills and committed customers made the difference. Congratulations to Peter Raphael, Ben Browne, Jackie Paulson and guide Adam Clark. 2003 was an unbelievable year for us on Elbrus. We advertised one trip in early August which I personally led. We had so much interest in the program that we also filled a second Elbrus trip in mid August and that trip was never even advertised. We ended up taking a total of 24 climbers to Elbrus this past summer and 23 of those individuals reached the summit. Well done, team. This speaks well for our acclimatization schedule and for the quality of our Russian guide friends. Igor Tsarouk is my 'main man' in Russia and continues to help me put together a super experience in that country. St. Petersburg, Moscow, fun training days and Elbrus make for a nice program. Congratulations to Ryan Dahlem, Bill Powell, Carol Hodges, Ed Homan, Elizabeth Smith, Glen Wright, Hanna Marschall, John Dahlem, Kevin Flynn, Michael Eackhaut, Rick Lundberg, Stuart Smith and Todd Marlatt. 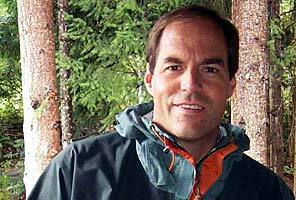 John Race led our second trip to Elbrus in mid August 2003. They, too, did very well. Congratulations to Alan Chambard, Carlos Vallejo, Dan Garst, Eric Peterson, Gary Lee, Jack Sutten, Jana Hoyer, Michael Lanigan, Roger Burleigh, Ralph Rydell, Steve Larson and Stewart Fleming. What a great two weeks. Kilimanjaro is a fun climb and the safari is the frosting on the cake. 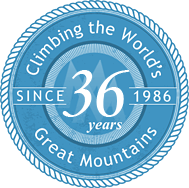 We have been running climbs there since 1989 and we have always been able to reach the summit. Continuity is power and we have worked with the same outfitters for years. They know we'll be back and they never let us down. This is THE trip to do with an athletic spouse or teenager. JUST DO IT. You won't be disappointed. Read the write up on the web site. No corners are cut on this program. I've already schedule one private group for 2004. Grab a group of friends and do the same or join one of the scheduled departures. Congratulations to Alan Morrison, Catherine Bell, Eric Locker, Ian Olgeirson, Jackie Paulson, Katherine Breedis, Mary Figge, Michael Bellamy, Michael Bellamy, Jr. Richard Ripple and Sami Matuq. Chris Booher and Kent Wagner took a group over in August 2003 and they all did well. Congratulations to Fare Arguello, Gary Malcolm, James Bolton, James Quigley, Jim Bolton, Justin Quigley, Kathleen Stone, Krissa Bolton, Mary Ivy Noone, Pam Malcolm, Robert Bolton, Roger Noone, Sam Quigley, Sandy Drahotas and William Engels. I head to Antarctica the day after writing this news letter. 1987 was our first scheduled trip to Vinson and we'll go down there every chance we get. Going to Antarctica is about as close as you'll ever get to being on another planet. It's not inexpensive but it is an amazing place. Think short, COLD Mt. McKinley climb when you think of Vinson. I'm out of here tomorrow with 6 climbers and guide Romulo Cardenas. Congratulations, in advance, to David Curl, Jeremy Barnes, Kirk Allen, Stuart Smith, Todd Marlatt, David Golden and guide Romulo Cardenas. David Hahn led the January 2003 expedition. 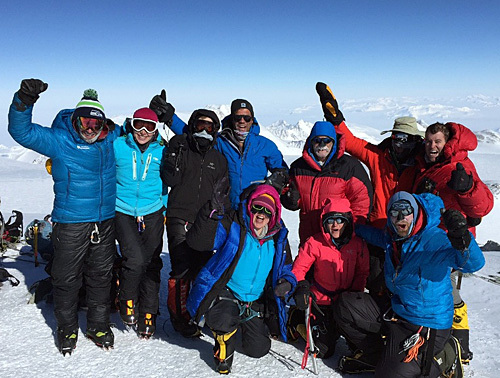 Three climbers were on the team with Dave and three climbers stood on the summit. We still haven't missed on Vinson. Congratulations to Bruce Parker, Cynthia Gist and Mark Cole. We'll be waiting for your call or email. Eric, George and I are always happy to speak with you personally and answer all your questions regarding a particular trip. We appreciate your support and your business and look forward to another summit with you in 2004. I'd like to start by taking a quick look forward to my 2004 climbs. We kick off the year with our great winter Kilimanjaro programs, during the January-February season, and another climb in June. In March we will return to Mt. Everest with two expedition teams, one to both the Tibet and Nepal sides of the mountain. From Tibet, Jake Norton, member of the '99 and '01 Mallory expeditions and two time Everest summitter will lead the ABC trek and North Col climb. He will be joined by my longtime friend and Nepal agent Ang Jangbu Sherpa, himself an Everest summiter. We already have a nice group forming up for this team, which will trek overland from Tingri, Tibet to Rongbuk Base Camp, then continue all the way up to Advanced Base Camp (over 21,000 feet, the highest point on earth that can be reached non-technically). 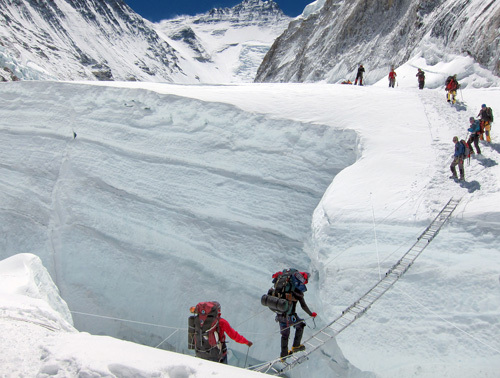 We'll also have a group of climbers who will tackle the famous North Col (to 23,000 feet). The great thing about the North Side is all the history associated with this area. At the same time we'll also have a non-guided group on the Nepal Side of Mt. Everest attempting to climb to the summit, under the leadership of Everest summiter Mark Tucker, as well as a group heading up the Khumbu Base Camp and Island Peak led by IMG's Phil and Susan Ershler. After a summer on Mt. Rainier with my Emmons Glacier guide service Mt. Rainier Alpine Guides (www.rainierguides.com) I'll be sending another team to Cho Oyu in August, marking IMG's 13th consecutive expedition there. 2003 was another good year for Kilimanjaro. I continue to organize the winter/spring/early summer programs and Phil Ershler organizes IMG's late summer/autumn trips. For 2003 I put together six groups, and personally joined two of them. They were all successful and we had a series of great trips. Thanks to guides Craig John, Adam Angel, and Greg Wilson for a terrific job keeping everyone safe and leading most of the climbers all the way to the top. In September I went back to lead a group of my friends from Carleton College class of '77 to the summit... we dreamed the trip up at our 25th reunion last year! We conducted Cho Oyu in the autumn season in 2003, our twelfth expedition to the world's sixth highest mountain. 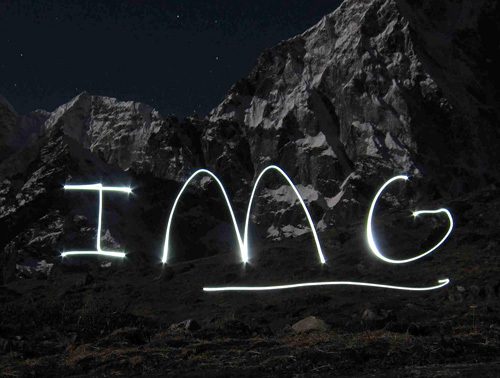 The climbers had another good trip this year, and I'm delighted to report that we have now had over 100 people reach the summit of Cho Oyu with our IMG teams since 1995. 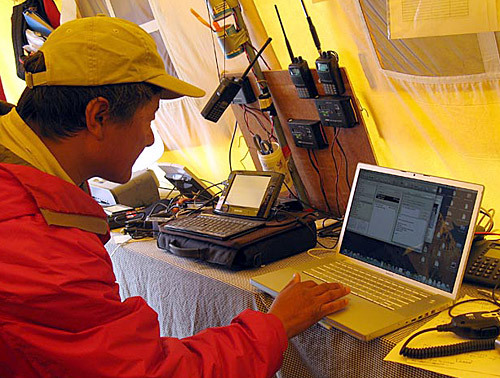 Like Everest, Cho Oyu is different every year... that is what keeps it interesting! I'm pleased to report that under the leadership of Mike Hamill, Chris Booher, Ang Jangbu Sherpa, and assistant guides Justin Merle and Garrett Madison, seven members of the team reached the summit on September 26th. This marks our eleventh successful climb of Cho Oyu, with over 100 successful summit climbers since 1995. We ran a reconnaissance trip to Ama Dablam, the beautiful and technical climb near Everest. This climb has gained popularity in recent years. 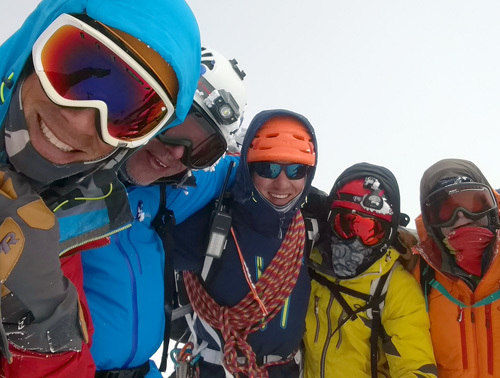 Our group, conducted at a 1:1 guide ratio, reached the summit under the leadership of IMG guides Tap Richards and Chris Booher and IMG Sherpas Kami and Dorje. This is a challenging climb with fantastic exposure, and is quite intimidating for climbers who have not done very much technical climbing. Congratulations to: Rich Emmett, Charles Cooney, Mathew Cooney, Tap Richards, Chris Booher, and the amazing Ang Chhiring Sherpa (Kami) and Dorje Lama Sherpa. It is our intention to run this trip again in Autumn 2004, as a 1:1 guided climb. Please contact Eric Simonson for further information.